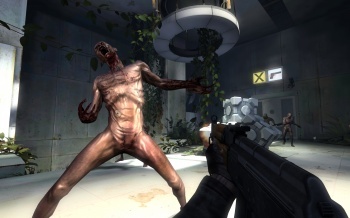 Valve enlisted the brains of the Potato Sack indie developers to help create the Portal 2 ARG. The ARG Valve used to generate hype for Portal 2 saw GLaDOS invade the Steam Potato Sack bundle, 13 indie games made available at a discount for a limited time. You might think that Valve brought these indie developers into a lair and forced them to do its bidding, but as it turns out Valve handed over the reins and made the ARG a collaborative process. The Potato Sack games were altered in various ways to make it seem as if GLaDOS was trying to use them to come back into existence. Audiosurf's Dylan Fitterer told Edge how this game about. "Valve invited a bunch of us indie developers to come out last December for a 'Cross Game Design Event,'" he said. "It was a bit mysterious, but definitely sounded like fun." "Jeep [Barnett, Portal 2 programmer] coordinated with us most closely, but Gabe kicked it all off," Fitterer added. "He asked us to work with them in creating an event that put launching Portal 2 into the community's hands. We were given free rein to design it and were also given access to any IP we wanted." Ichiro Lambe of Dejobaan games revealed that Valve gave each developer a basic framework involving GLaDOS and said: "Go make it happen." Can you imagine being invited to Valve and getting to be involved in something so secretive and integral to a major franchise? I would have freaked out. Thankfully, the Potato Sack develolpers put things together pretty nicely. Puzzles, secrets, and entire Portal levels were added to games like Super Meat Boy and Amnesia: The Dark Descent. The craziness surrounding the Portal 2 ARG only makes me wonder what Valve has in store for the pre-launch of the next Half-Life entry. It'll probably involve time and/or dimensional travel. And maybe donuts.